This entry was posted in self-defense, weapon and tagged 380ACP, keltec, P3AT. Bookmark the permalink. You don’t need the “very” and it gets in the way. “small” works fine, as do little, or (my preference) tiny. One word is better than two. For a background I might use a gift certificate to a training course- against the 8 1/2 x 11, the pistol looks tiny indeed. 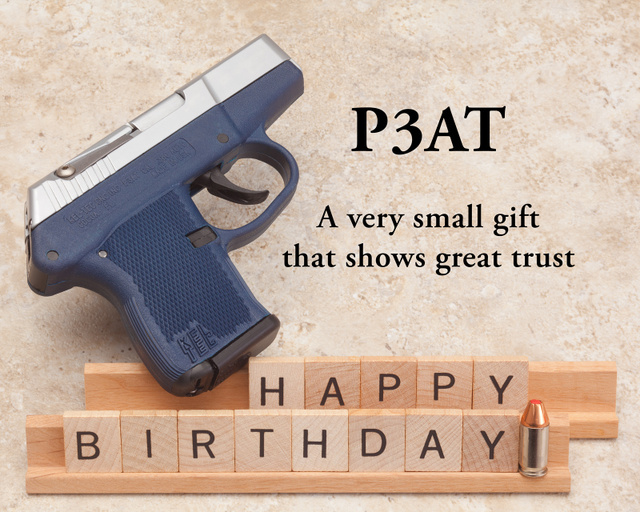 That all depends on what your reference for size is; if a Glock 26 is a small gift, a PF9 may be quite small, and by extension a P3AT or P32 would qualify as very small or perhaps tiny. Perfect layout. Clever! On my wish list! So, is that a gift to you or from you?